When asked to describe the attributes in a vice president he’s looking for by Cenk recently, Bernie said, playfully, he “would look for somebody who is maybe not of the same gender that I am and maybe somebody who might be a couple of years younger than me” and, less playfully, “somebody who can take the progressive banner, as vice president, and carry it all over the country to help us with our agenda and help us to rally the American people.” Sounds like Elizabeth Warren, no? Kamala? Is she an actual progressive? Tulsi? [Just take my word for it– and I hate to put it this way– ain’t gonna happen.] Nina Turner? Not impossible. Stacey Abrams? That wouldn’t come as a shock. But I’ll stick with Elizabeth Warren for my guess. “When,” Bernie said, “you talk about other candidates, Elizabeth Warren is someone I have known for over twenty years. She is a friend of mine and she is a very, very good senator and a very serious person.” Keyword: serious– and many think Bernie and Warren are the only really serious contenders in this race. Warren blamed the lenders. Many credit card companies charged so much in fees and interest that they weren’t losing money when some of their customers went bankrupt, she said. “That is, they have squeezed enough out of these families in interest and fees and payments that never paid down principal,” Warren said. At this last remark, Biden smiled and sat back in his chair, according to Mallory Duncan, a lobbyist who was in the room. “It was like watching a championship tennis match,” Duncan told me, more than a decade later, of the sparring between the two future presidential candidates. Fourteen years later, Warren and Biden are expected to find themselves facing off again, this time on a much larger stage. And while a bill that passed in 2005 is unlikely to dominate the 2020 Democratic primaries, the fight over the bankruptcy legislation helped shape Warren politically and could be a surprising liability for Biden in the race to become his party’s choice to replace President Donald Trump. The bill, which was signed in to law by George W. Bush two months after Biden and Warren tangled, made it harder for Americans to discharge the debts they accrue from things like credit cards and medical bills. According to one study, the law “benefited credit card companies and hurt their customers.” Delaware was home to one of the nation’s biggest credit card issuers at the time, and advocates on both sides of the debate saw Biden as trying to represent his state’s interests in Congress. But with emotions still raw about the banking bailouts of the Great Recession, some Democrats see Biden’s vote for the bill as part of a broader record that’s not as progressive as he’d like it to appear. And the issue may have special resonance in a primary in which Democrats will be competing for the chance to try to defeat a president whose businesses have gone bankrupt half a dozen times, and who bragged, during the 2016 campaign, about using the nation’s bankruptcy laws “brilliantly” to his benefit. But bankruptcy scholars say the law has made it harder for people in financial distress– especially the poor– to file for bankruptcy. Hundreds of thousands of people who might otherwise file for bankruptcy have delayed doing so, according to research conducted by Warren and others who’ve studied the law. Meanwhile, there’s little evidence the law has tackled the problem that Biden and other lawmakers described as the reason that bankruptcy laws needed to be changed in the first place– a supposed surge in bankruptcy fraud and abuses. “I doubt that the bill reined in the abuses that the bill was premised on, in part because they didn’t necessarily exist in the first place,” said Melissa Jacoby, a law professor at the University of North Carolina who studies bankruptcy. Even so, Biden has expressed misgivings. One of the bill’s hundreds of provisions was to bar those who file for bankruptcy from getting rid of private student loan debt. (Government-backed student loans, which make up the vast majority of student loan debt, were already exempt from discharge in bankruptcy.) But “the private student loan market in this country has changed dramatically since 2005, in part due to the increase of for-profit education,” Russo said. 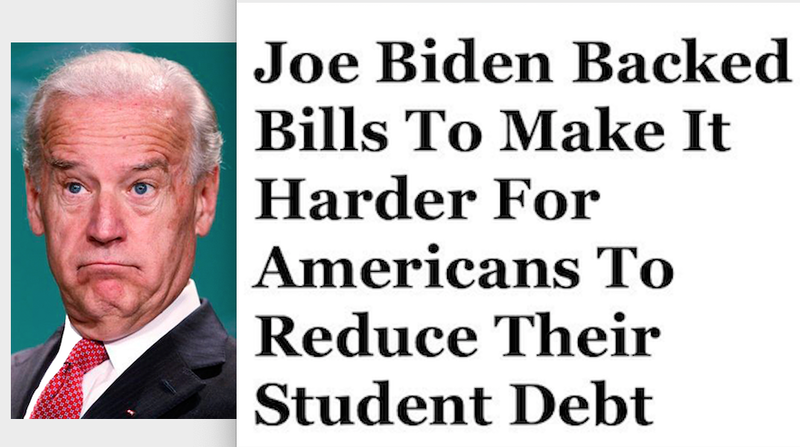 In 2015, the Obama administration asked Congress to pass a law allowing those with private student loan debt to eliminate it through bankruptcy– reversing the change Biden had voted for a decade before. Congress hasn’t done so. Former Sen. Chris Dodd (D-CT), who voted against the bill, described it as “one of the worst pieces of legislation of all time” when he ran for president in 2008 and questioned former Sen. John Edwards’ vote for it during a presidential debate. But Dodd told me he didn’t see Biden’s vote for the bill as a fault line between Biden and Warren. “I would call them both progressive Democrats, and they’ve reflected that throughout their careers,” Dodd said. 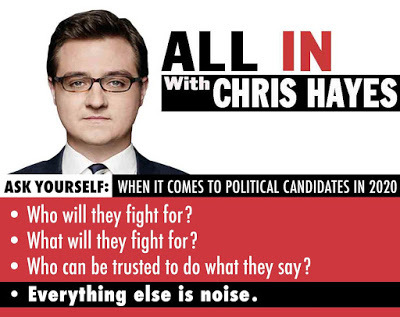 …[S]ome progressives say he hasn’t done enough to make up for what they see as his past mistakes. Biden’s vote for the bill, along with those he cast in favor of the Iraq War in 2003 and the crime bill, are “very out of step with where the electorate is,” said Rebecca Kirszner Katz, a Democratic operative who’s worked on the campaigns of progressive candidates such as Cynthia Nixon and New York Mayor Bill de Blasio. Biden’s record in President Barack Obama’s administration doesn’t absolve him of his votes in the preceding decade, she added. “I don’t think he just gets a pass because he was Obama’s vice president,” she said. …Biden was one of 18 Democratic senators to vote for the bankruptcy bill in 2005, but of the more than a dozen current and former members of Congress who are running or considering running for president, he is the only one who voted for it. 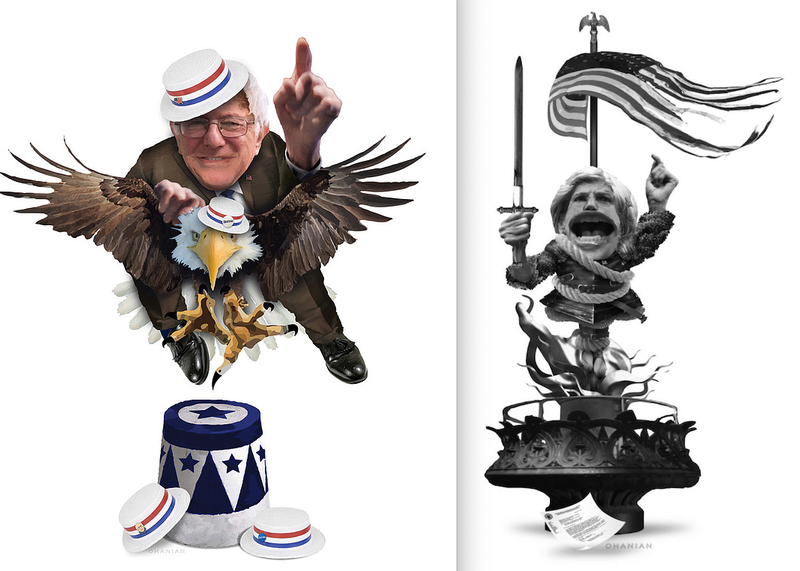 Two other candidates– Sen. Bernie Sanders of Vermont and Washington Gov. Jay Inslee, both of whom were in the House at the time– voted against it. While Biden’s support for the bill is unlikely to torpedo his campaign by itself, it’s easy to imagine his rivals using it to help make the case that he’s too close to Washington lobbyists and Wall Street. Before he tapped Biden as his running mate, Barack Obama criticized John McCain during the 2008 campaign for “siding with banking industry lobbyists” by voting for the bankruptcy bill. Sanders suggested in 2016 that Hillary Clinton had capitulated to the financial industry by voting for a version of the bill in 2001. (She didn’t vote on the 2005 bill.) And Warren herself has mused on how presidential candidates’ votes for the bill might be turned against them. As an example, she cited Rep. Albert Wynn (D-MD), who faced a primary challenge in 2008 from an opponent [Donna Edwards] who attacked him over his vote for the bankruptcy bill, among other issues. Wynn lost in a landslide– then resigned to become a lobbyist. Who Biden has fought for for his entire miserable political career, should tell you exactly who he would continue fighting for if– God forbid– he gets into the White House, a candidate whose only redeeming quality would be that he’s better than Trump, the lowest political bar ever.